It Costs More to Divorce than to Marry! Did you know it costs a whole lot more to get divorced than it ever cost to get married in the first place? I'm talking the court costs only that everyone has to pay. Not the option expenses like the wedding or splitting of assets or child support. Just the actual filing and registration costs. To get married, at least in BC all you have to do is apply for a marriage licence. That costs $100.00. The minimum cost to get divorced $370.00. We filed our first set of paperwork back on March 12th, 2013. We just filed four more forms this week. The requisition, the certificate of pleadings, the affidavit and the final order. Why so long? Because we didn't realise they hadn't been filed! They have now. The Courts are running about 6 months behind so we have that long to wait to see if our divorce is finalised or if it's rejected because we missed checking one measly box on a form. Keep your fingers crossed. We have a lot of little girls and boys* in our life that we like to give birthday/christmas gifts to. They lose interest in toys (and have so many of them), and grow out of clothes, usually we give books or christmas decorations. I needed something new this year. I wanted something they could keep, use again and again and that their mum and dad wouldn't have to trip on or fall over. But what? I pulled out all my sewing and crafting books to search for inspiration. I found several ideas I liked but they weren't very exciting. I was obviously having a slow day or two. Yeah, I know sometimes I can be slow! Several hours later I decided to make the different ideas as a kit. A celebration kit. 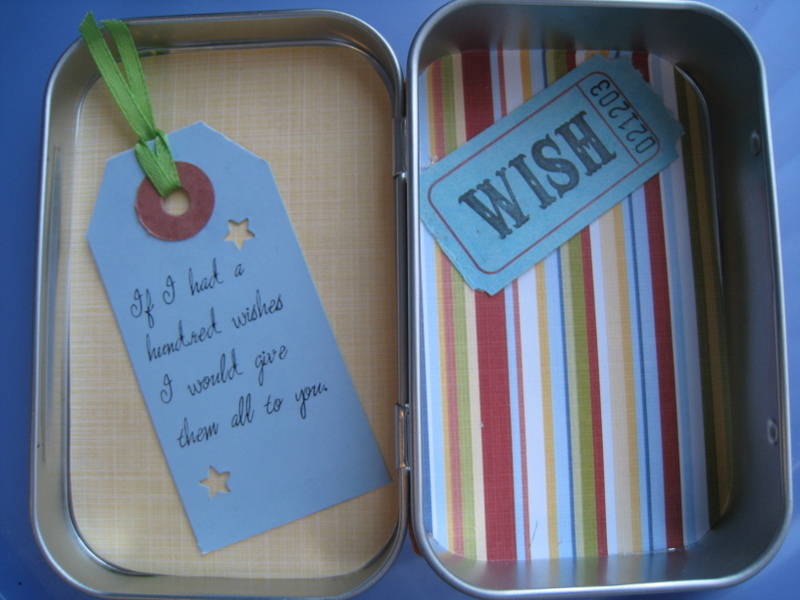 A suitcase full of wishes. To be used for birthdays, first day of school, last day of school, learning something new, passing a test, any time that calls for a celebration, or maybe as a pick me up party. 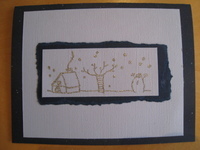 A banner from The Creative Family by Amanda Blake Soule. A felt crown this time using the instructions in The Creative Family. 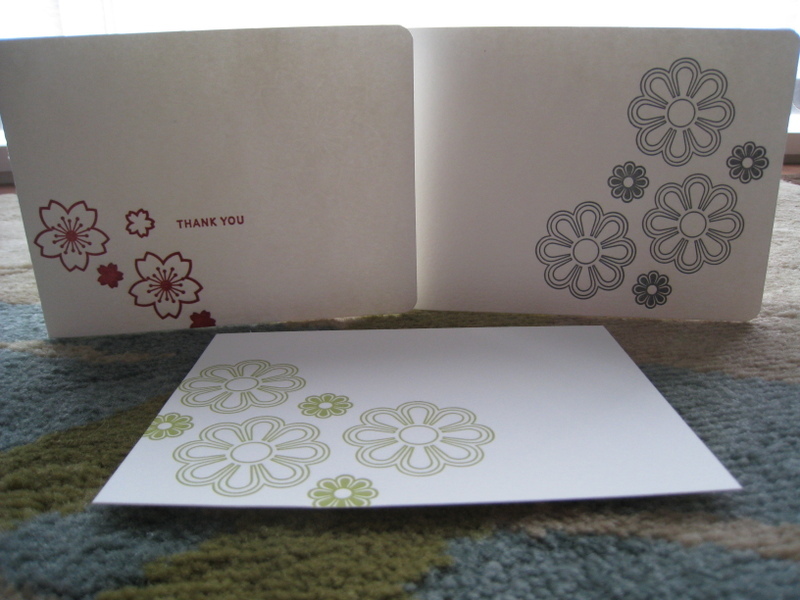 Last year I used Lera's pattern. I like a mix of the two. I prefer Lera's pattern, but I like using the felt, so I don't have to worry about sewing the right sides together and turning it all right side out. 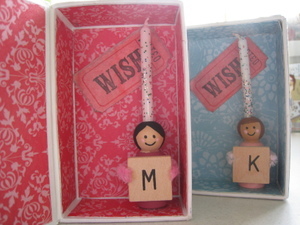 and a candle holder in a box of wishes. I'm thinking I need to add a celebration plate and maybe a glass or mug of some description. * and some big kids too. Megan and Ryan used to live next door. They collected our mail, watered our plants and kept the riff raff out when we were away, which was often. 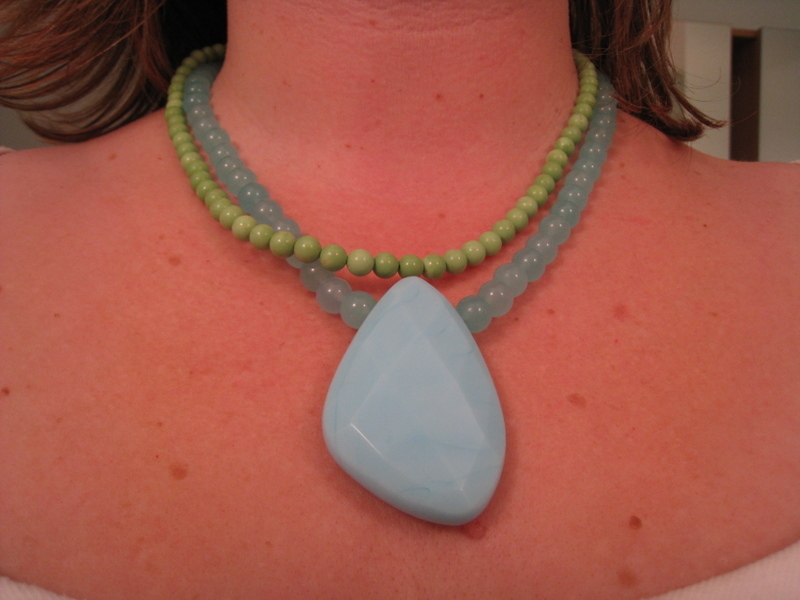 Megan creates and sells jewelry. It used to be a part time thing, and she sold mostly on the web. 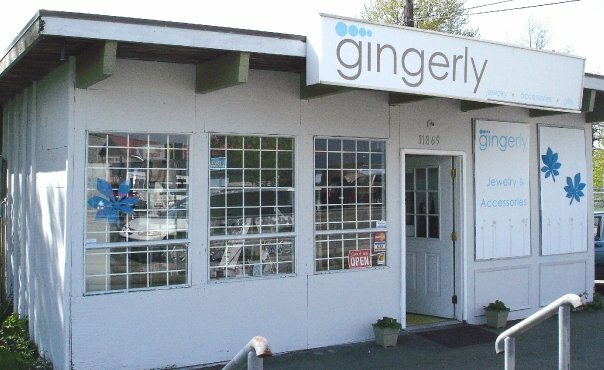 But earlier this year she opened her own store in Maple Ridge. 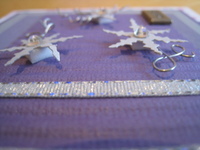 I have two pieces of jewelry from Gingerly Designs. When Megan still lived next door, Dave bought me this necklace for my birthday. Blue and green - my favourite colours. I wear it lots and I always receive compliments on it. The second necklace I bought for myself. 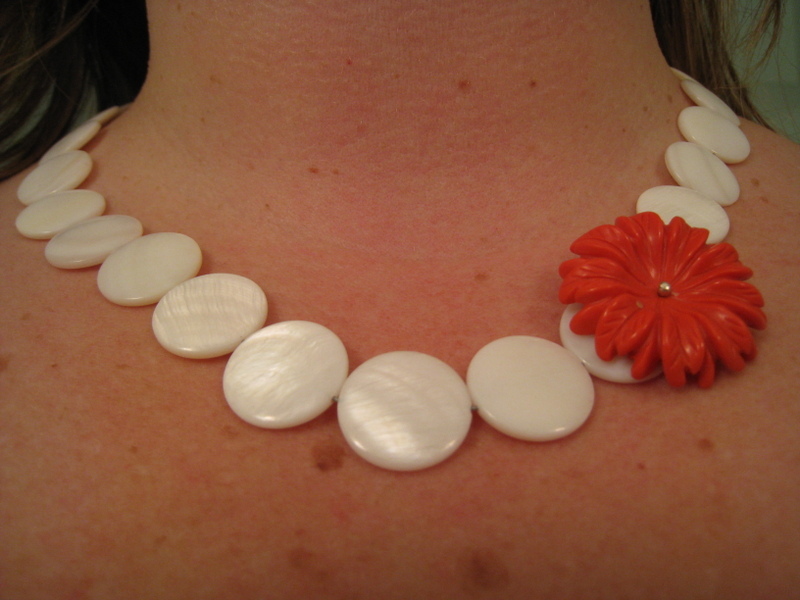 It just seemed like the perfect piece for summer -white mother of pearl with a pinky, orangy, coral flower. I don't want to give them away now. How selfish is that? 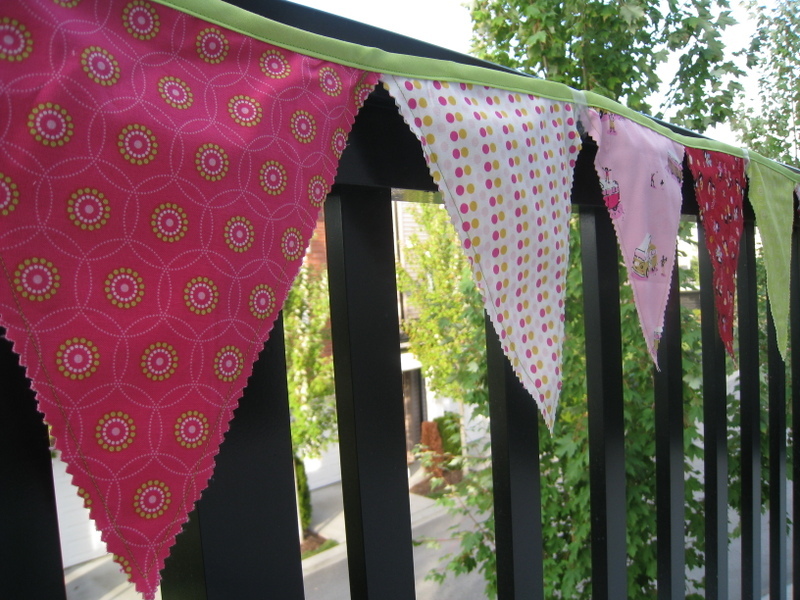 Kelli posted a while back about organising her stamping stuff, knitting supplies and fabric. Seems we were thinking along the same lines. I posted before, and I should have just bought those boxes. Instead hubby and I made it into a much bigger project. Once all my boxes are organised, they'll need somewhere to go. Hubby's tired of finding crafting stuff in the dining room and living room. 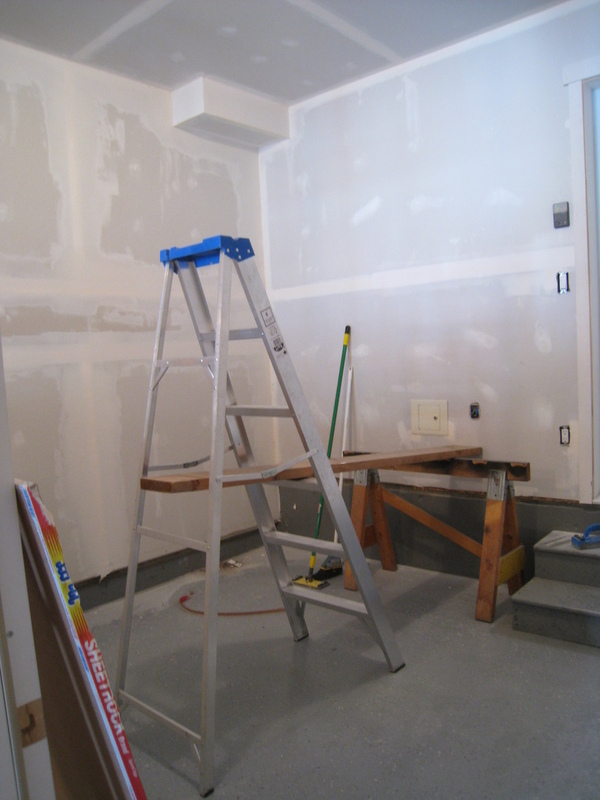 So he's making me a craft room! 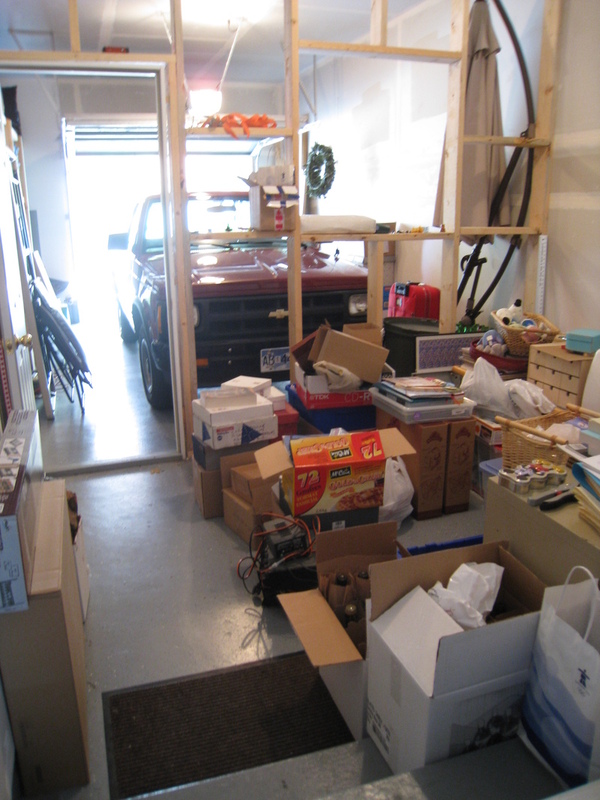 We have a long skinny garage, which we only keep one car in, so half the garage is empty. We should use the space, right? So up goes a wall. 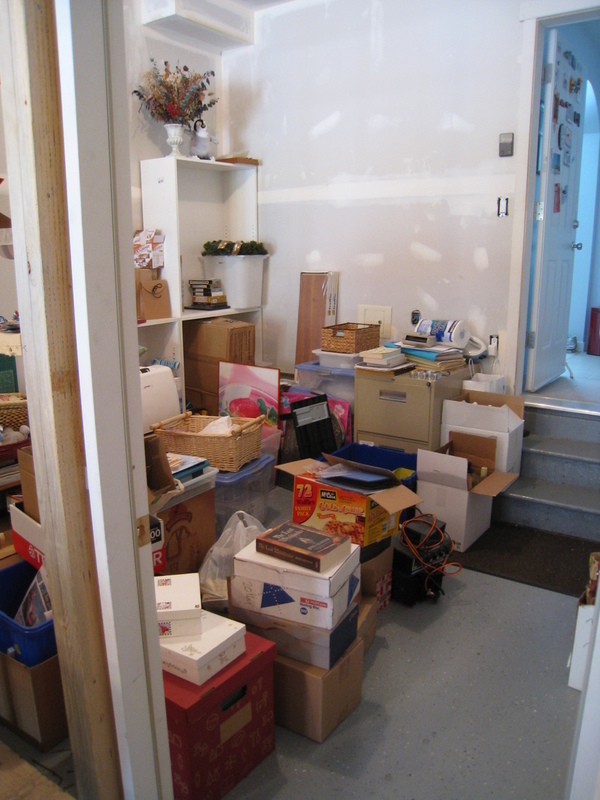 and all that stuff in boxes? It's now where the truck normally lives. The truck is on the street. 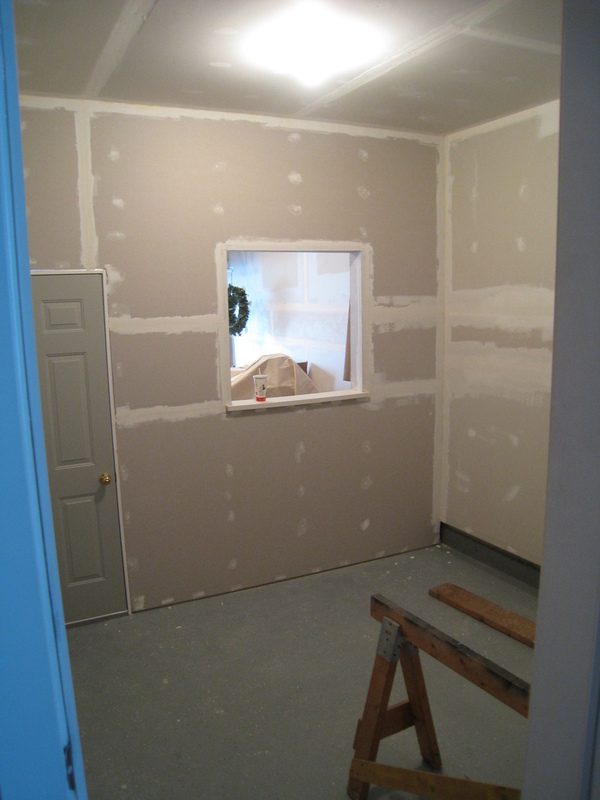 The drywall is up, the mudding is done, it needs to be sanded and then painted. Maybe next month. On and off over the last few months I have been trying to organise my craft stuff. 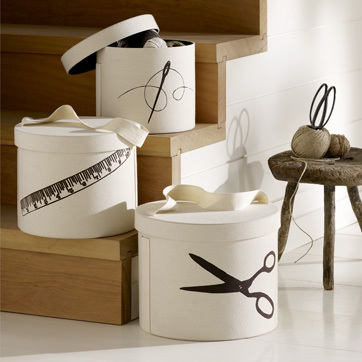 I haven't been inspired to craft recently, and I think part of my problem is my supplies are everywhere. Its in boxes, baskets, bags, drawers and not very well organised. Some is in our home office, some in the dining room, some in the garage and yet more at the hangar. So I can never find anything when I need it. Now that I know what I have and where it is, maybe I'll craft some more. 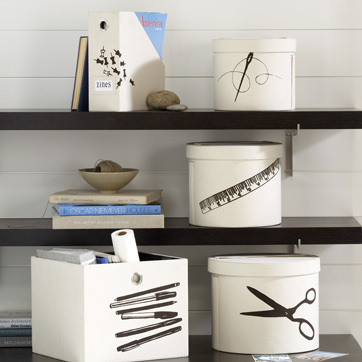 How do you store your sewing, craft, art stuff? I like these. I don't need them, have no where to put them, but aren't they cute. They're from West Elm. Not enough. I can't believe the year is already half way over. Where did it go? I'm still working my way through that Christmas list of mine. This was my May project for Christmas in Progress. 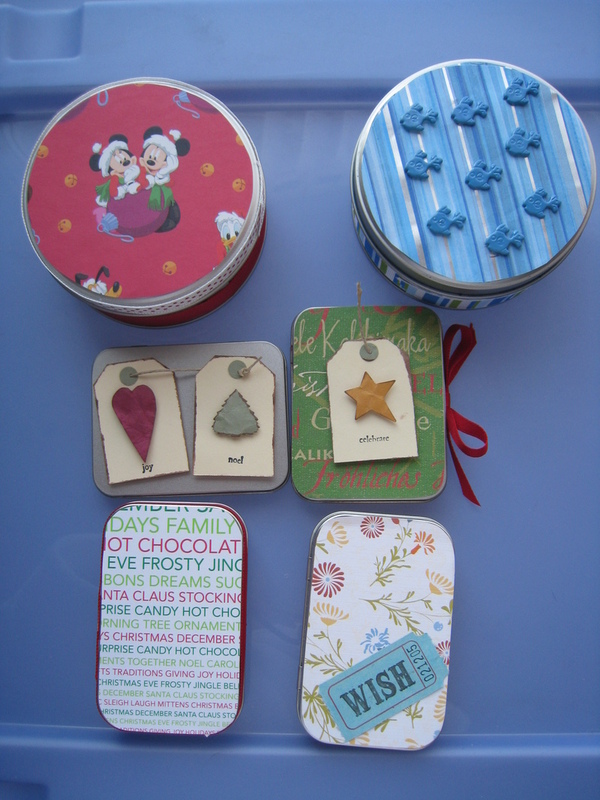 Originally I was going to bundle these up, tie a ribbon round them and give them as gifts. 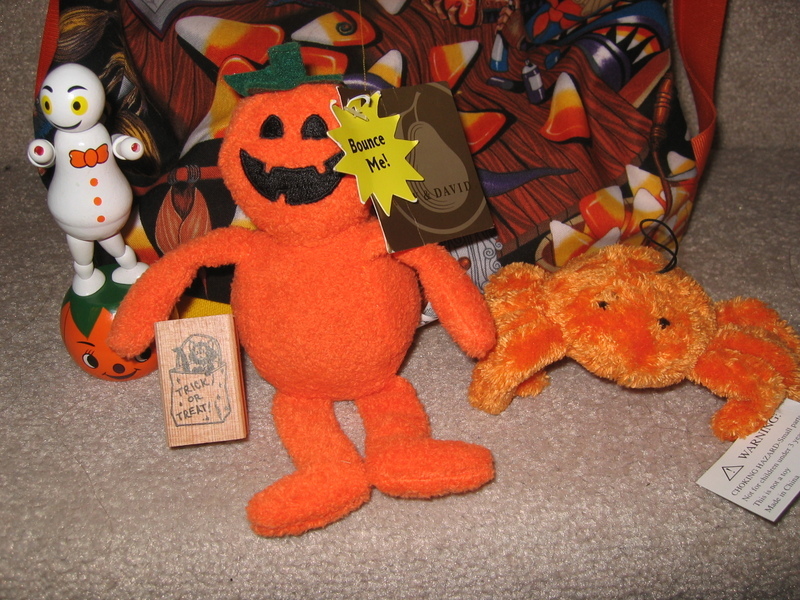 But if I give them at Christmas, then they won't get used until next year. Maybe I'll use them instead. Or maybe I'll gift them in November as a 'get ready for Christmas' gift. 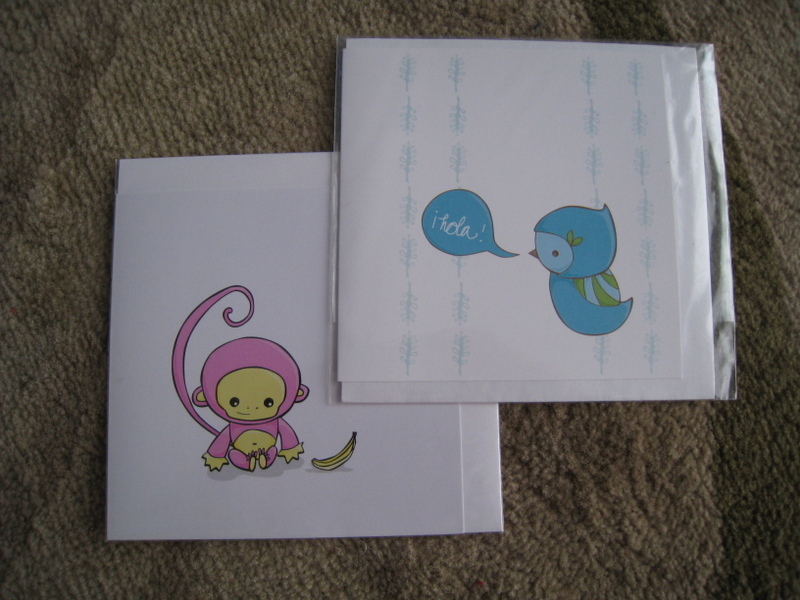 However I did have one friend tell me she'd be insulted if I gave her a bundle of cards. I didn't ask why. Would you be insulted? 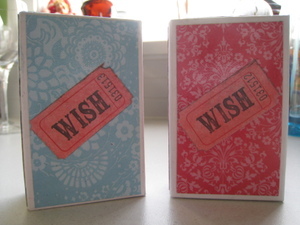 The first group of cards I made in a card making class that a girlfriend and I attended at a local scrapbooking store. They look pretty but they are time consuming, fiddly and somewhat bulky. Look closely (or click for a larger image). 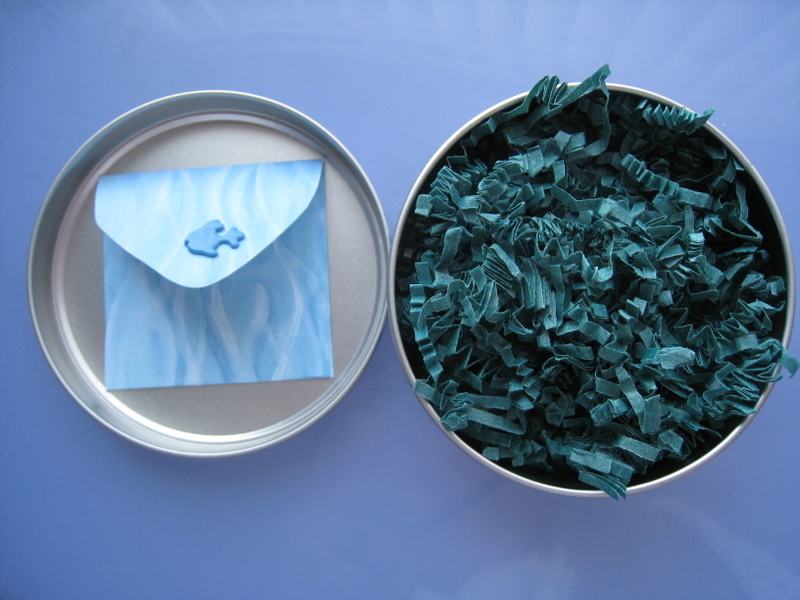 There was stamping, inking, crinkling, distressing, brads, ribbons, stickers, diecuts, pop up dots, glue, double sided tape, and little beads. The rest I made up as I went. I use these 5 stamps a lot. Every Christmas. I think my family and friends are sick of the seeing them. 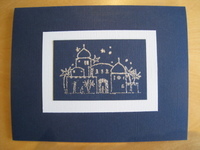 They are made by a local company - The Old Island Stamp Company. 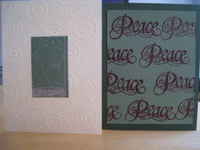 Christmas Message, Peace Forever, Bethlehem, Snowman Scene, and Mountainscape (this one has been discontinued). 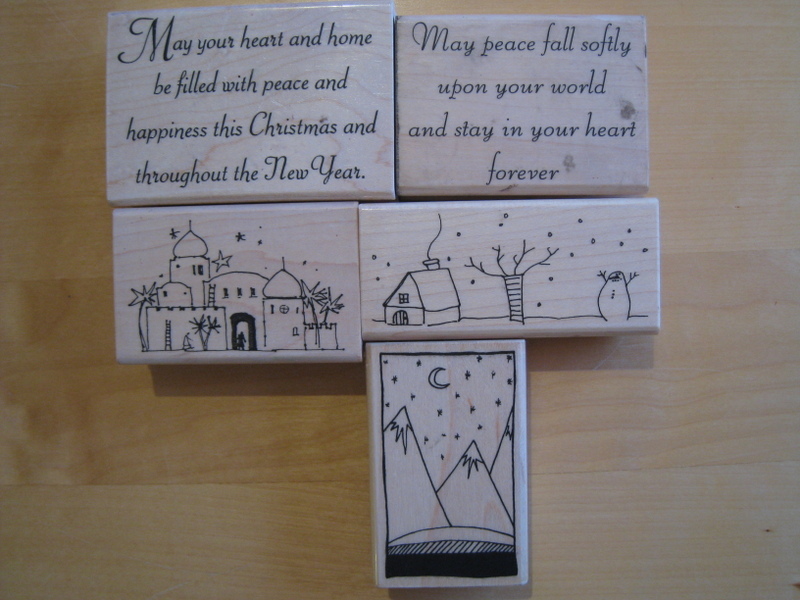 I have a bunch of other Christmas stamps, but they don't get used anywhere near as much. 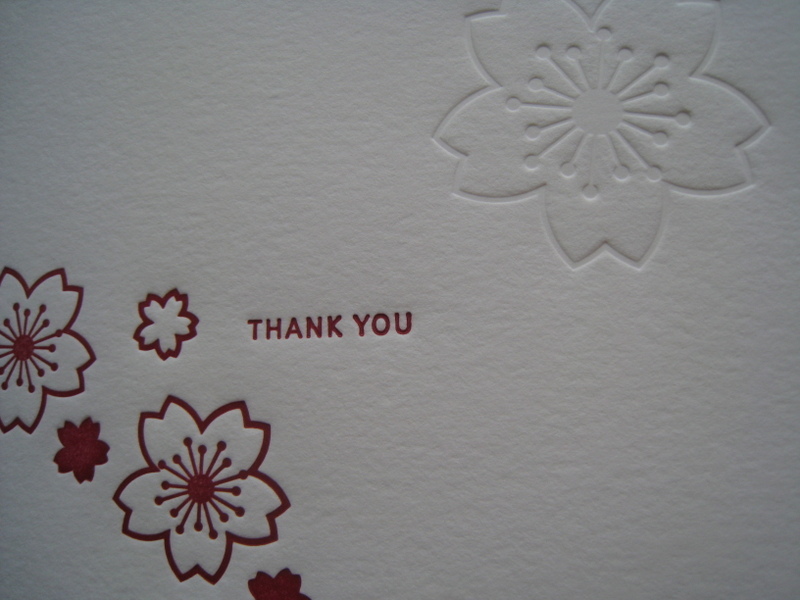 I like the stamped cards because they are simple and quick to make. I can make 10-20 in one sitting. 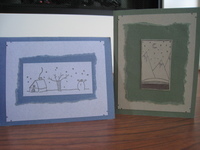 The pink snowman was my version of the blue one made in class. 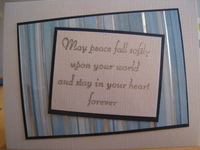 You can see larger images by clicking on the photos below. 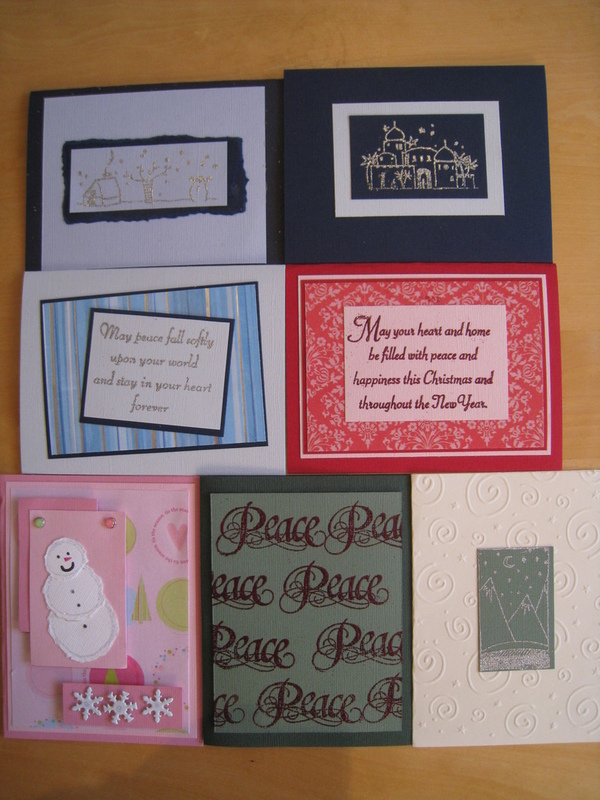 Do you make your own cards? Do you buy your cards? 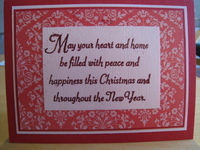 Or do you not send cards? Did you know that today is June 25th? That means that this time in 6 months it will be Christmas Day! Over Easter Michael's had a sale and some good coupons. I stocked up on a bunch of things, and took home a couple of "not sure what I'll use this for, but it seems like a good idea" items. 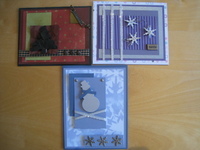 One of those items was a Martha Stewart shadow box. They were on sale. $2.00 each. I was going to buy more but the majority were in really bad condition. So I just got the one. Originally it was cream. It needed more life. A bottle of pink paint. 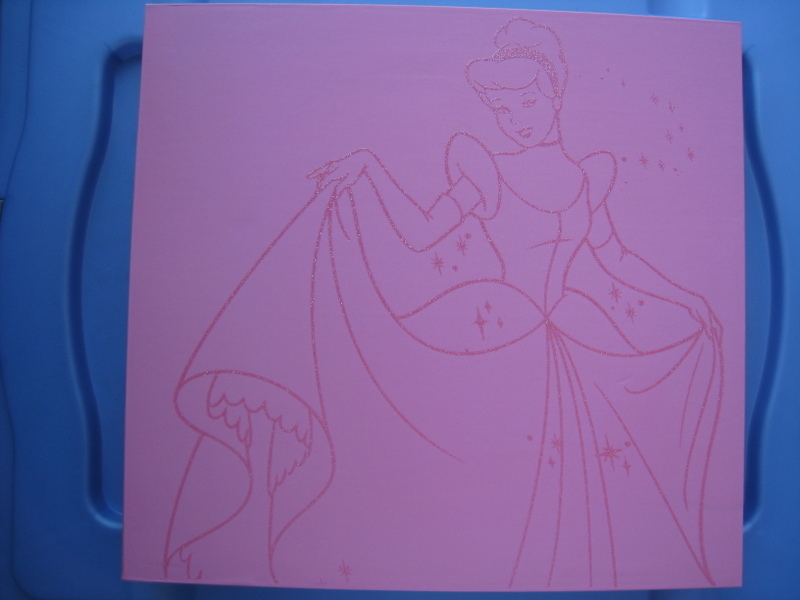 Some princess stickers. Some photos. 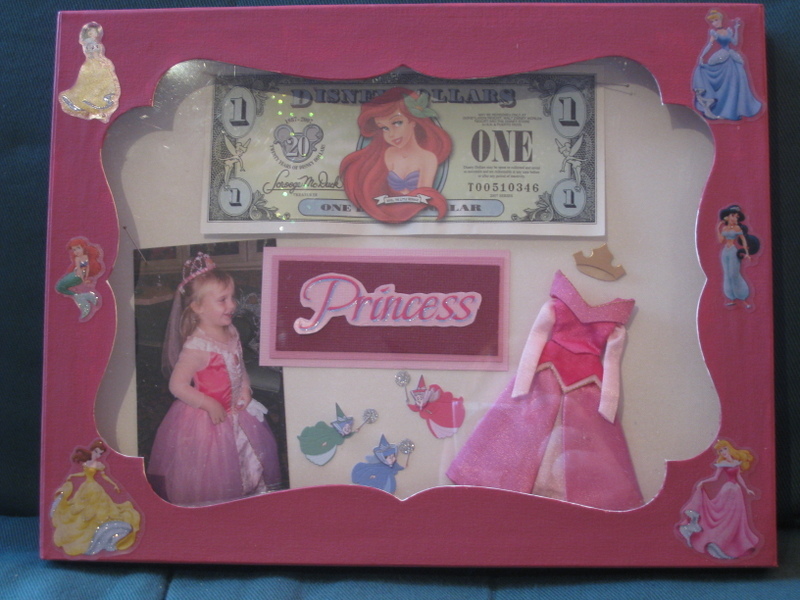 A Disney dollar. 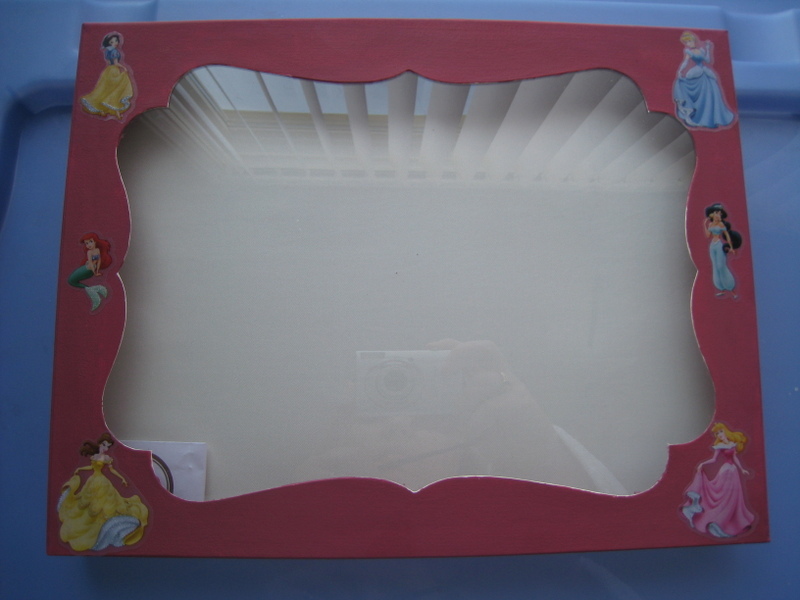 Another Christmas present for my niece. I think she's set now. Good thing she doesn't read this, or her there'd be no surprises for her. Now, I'm on a roll. Playing catch up but still on a roll. Initially this was supposed to be a February birthday present, but it wasn't finished in time. So it became my March project for Christmas in Progress. It wasn't done for March either. But it's done now. So one Christmas present is done. Christmas 2007 my in laws, sister in law, neice, hubby and I went to Disneyworld for Christmas. 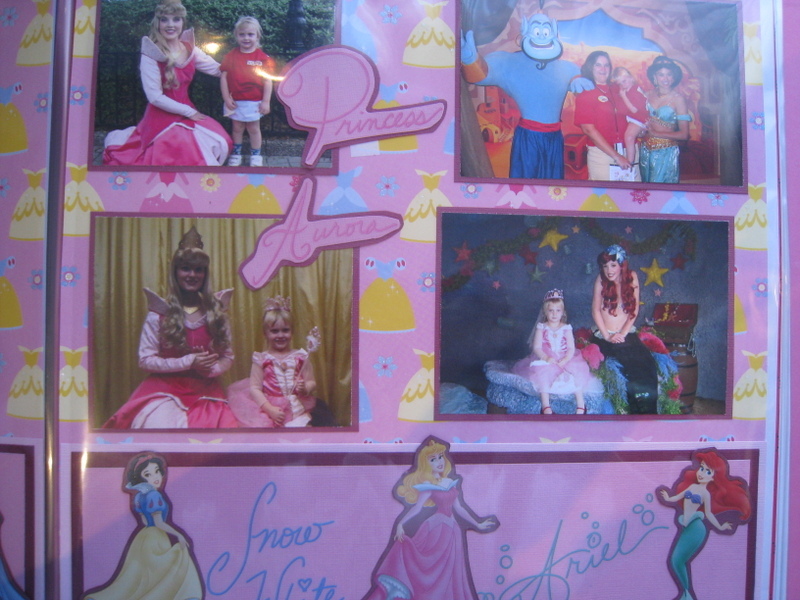 It was, then, 3 year old Taylor's first trip to Disneyworld. It's an album of a selection of photos and memories to commemorate her first trip. The album I got with a coupon at Michaels, and I had a lot of the papers and stickers already. Not entirely sure why I have so many princess stickers and papers. I put it together in about 3 hours while catching up on some Ellen episodes. 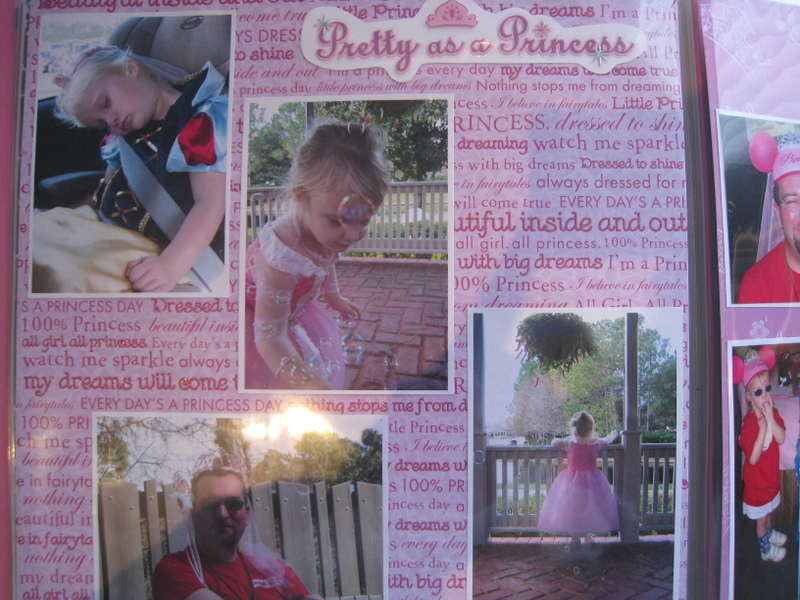 The pages are very simple, but hopefully it will help Miss T remember her first Disney trip. Excuse the crappy photos, I couldn't get any good light. 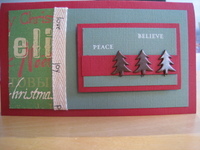 My February Christmas in Progress project is done too. 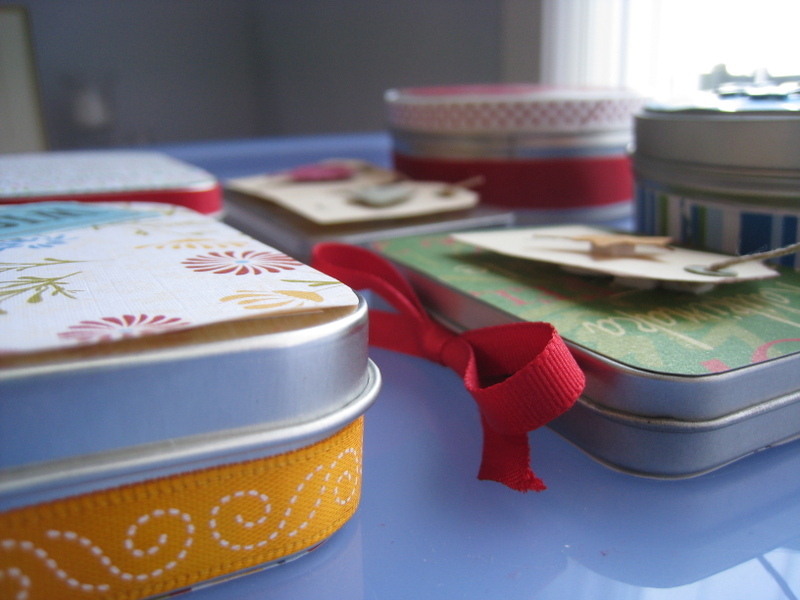 For some bizarre reason, unbeknownst to me, I have been collecting small tins. No idea why. They just seemed like a good thing to hang on to. 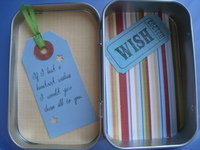 With a little help from my various crafting boxes - scrapbooking papers, ribbons, brads, wish tickets etc it's all done. 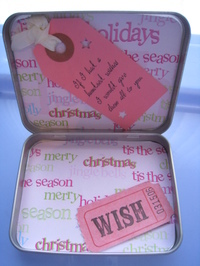 They will be used a Christmas for gift cards and small gifts, jewelry maybe. 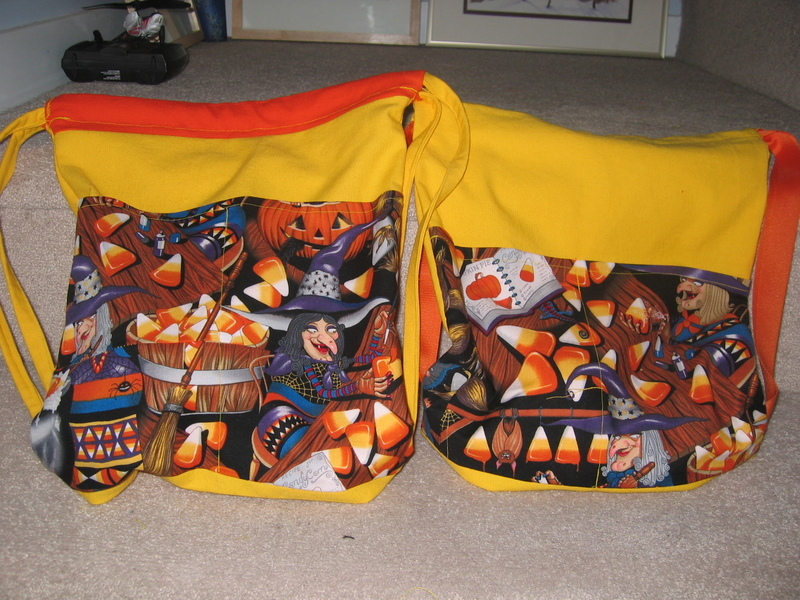 Here are the last 2 trick or treat bags I made. Again with the scraps. You'd think I didn't have any 'real' fabric around. I do. I'm just trying to use up some of the pile of little bits. Then I can use my stash, then I can justify new fabric! And sewing with scraps takes way too long. 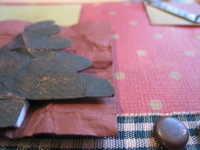 Piecing together enough small pieces to make a large piece is a nightmare. Especially when you notice after you're all done sewing that one piece is upside down. I try to leave it. But it annoys me. And I have to go back and unpick it, and resew it. No wonder what's listed as a 1 hour project takes me 5. And a sneak at the contents. What do you think I'm making with this pile of stuff? I know my hubby and my mother in law are curious. 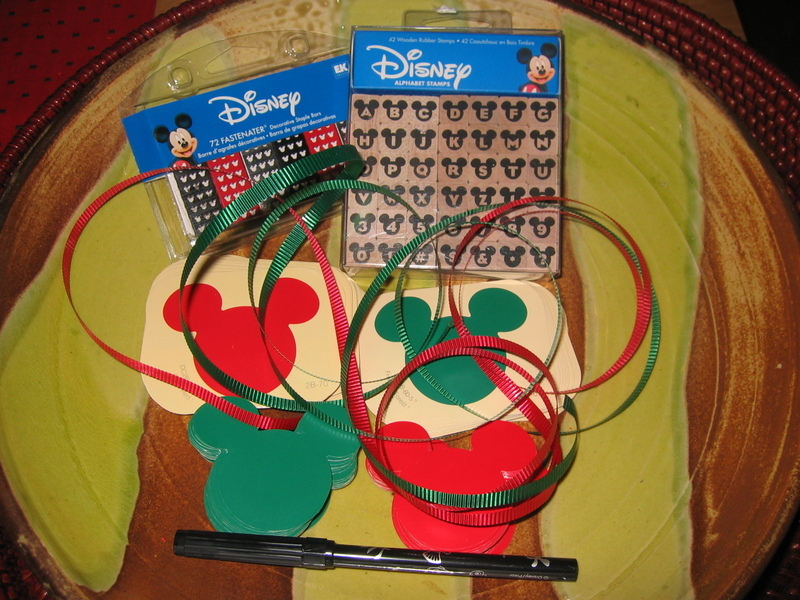 I sent them into Home Depot to get more of the Mickey Head paint chips, but wouldn't tell them what I needed them for. Yes, I 've been sucked in by the marketing. Yes, I've been brainwashed. 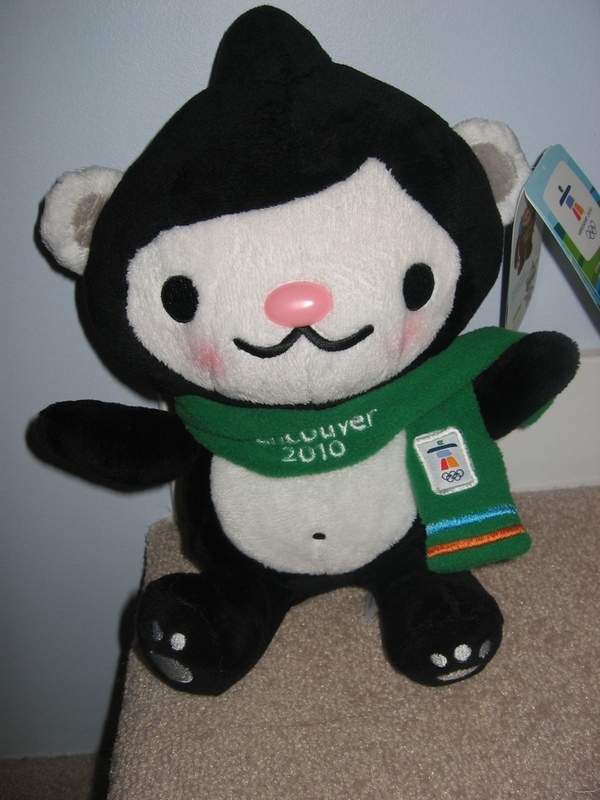 My favourite mascot is Miga, the seabear. Love the pink nose and the blush. Guess what? Hubby and I actually went on a date on the weekend. We don't get to do that very often, He's either working or at Search and Rescue. Or I'm at one of my two jobs. We had to take advantage of rare night when we both had no plans. So Friday night we had dinner and a movie. Picking a movie we both want to see is not easy. We both like Steve Carrell. He's hilarious in The Office, and in the 40 Year Old Virgin and Little Miss Sunshine. We finally agreed on Dan in Real Life. I liked it, hubby said it was almost a chick flick. He gets to choose next time. Then we can't whine. Or I'll choose and he'll have a reason to whine. I'm sure he'd love to see Enchanted. Not!